Making cheese from tofu is a simple process. My first attempt was this delicious Tofu Salata, that I happily grate on pasta dishes and I think it is fantastic. But I think there are more possibilities to explore. Firm tofu is already shaped like a lot of cheese. As it turns out, you can manipulate its texture easily. 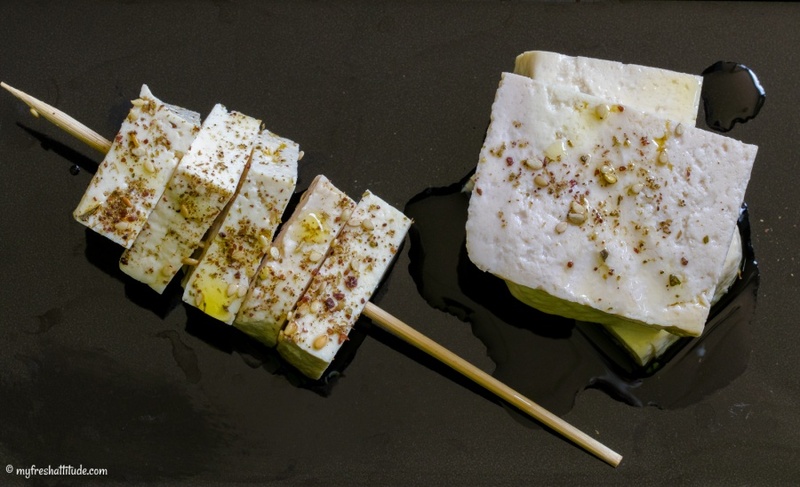 Freezing and defrosting firm tofu will create a sponge-like texture and marinating in a flavorsome liquid will turn the tofu into a spreadable consistency that is a bit crumbly. The last method had me thinking…I wonder if I could create something similar to feta cheese if I created an acidic and salty cheese-like marinade. As it turns out…the answer is yes! The secret to making this simple cheese is patience and using something like Rejuvelac to boost the fermented and cheesy flavor. After a week or so, you will be amazed at the flavor that is imparted into the tofu! Use alongside grilled vegetables, in a pie or in a salad…like a Greek Salad!